Advance casting of multiple mini gels can help to achieve consistent results between runs. 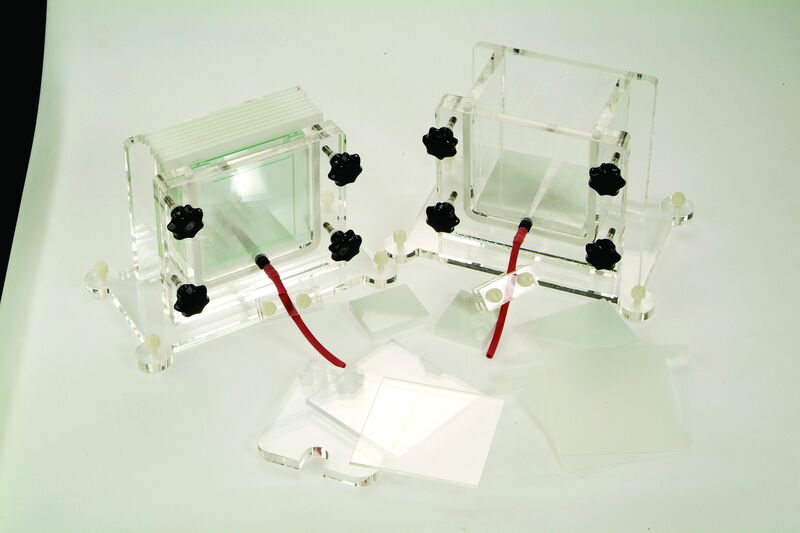 These multiple gel casting systems are tailored for use with omniPAGE mini vertical electrophoresis units; with three models of 6, 12 and 24 gel capacities. 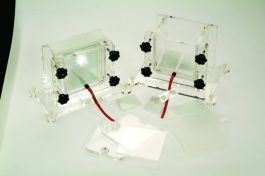 Fewer gels can be poured if required using the acrylic saver blocks supplied with each system. The fixed hinged clamps allows the gel sandwich to be adjusted to the correct pressure irrespective of the number or the thickness of gels being poured. Separation sheets allow the easy separation of the glass plates after pouring. 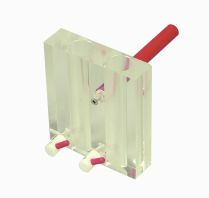 Ideal for Caesium, Sucrose and Gel gradients these Gradient Mixers comprise two chambers - a reservoir and a mixing chamber with an interconnecting valve. A second valve regulates the output flow from the mixing chamber. All mixers have a flat base which allows them to be placed on a magnetic stirrer. A magnetic stirring bar can be placed directly in the mixing chamber to ensure a constant gradient. The support rod allows the mixer to be fixed to a retort stand for extra stability.